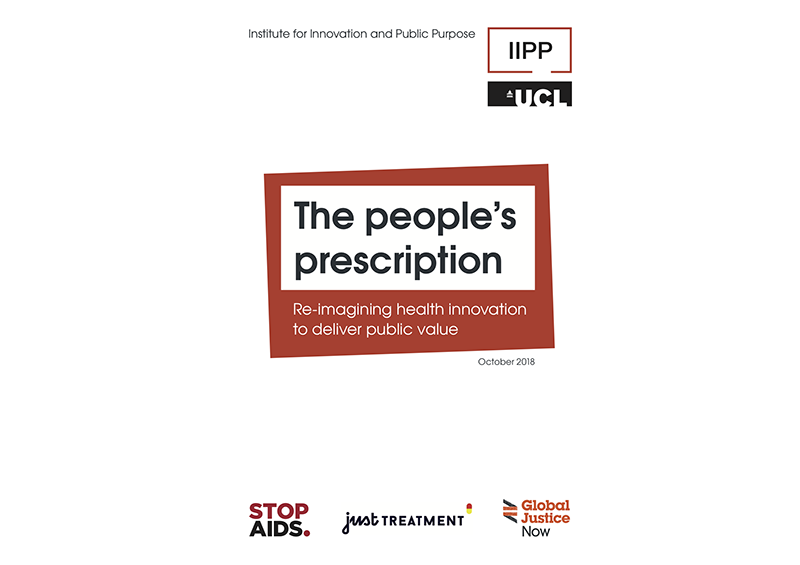 Major new policy report on re-imagining health innovation to deliver public value. A thriving health innovation system should generate new health technologies that improve public health and ensure access to effective treatments for the people who need them. However, our current health innovation system fails to direct innovations towards the greatest health needs, and is fraught with inefficiencies: when innovation happens, it happens more slowly and at great cost. Driven by profit rather than public health, the pharmaceutical sector is incentivised to set high prices and deliver short-term returns to shareholders, rather than focus on riskier, longer-term research which leads to critically needed therapeutic advances. The high prices of medicines are causing severe patient access problems worldwide, with damaging consequences for human health and wellbeing. These are symptoms of an innovation model that is broken. This report maps the fault lines of this system and sets out principles for a new one. While it does suggest some quick fixes that policymakers can implement in the short term, crucially it proposes concrete policy actions that can be taken in the long term to actively shape and co-create a health system that delivers real public value. Sign up to our mailing list for the latest research, news and events from IIPP.